I know most of you are probably calling El Bolso to make sure he brings me to the looney bin right now, but he lives across the country, so I’ll still have plenty of time to finish this post. You’re gonna have to just sit there and hear me out. First of all, the market for a guy like Tanaka is there. I have no doubt that Brian Cashman’s office phone would get flooded with calls if he decided to shop his 27-year-old ace. The free agent pitching market was hot garbage to begin with. Now that Rich Hill signed with the Dodgers–for an awful lot of money, no less–there’s no one out there worth signing… sorry Ivan Nova. I mean listen to some of these names… Jhoulys Chacin. Rubby De La Rosa. Ryan Vogelsong. Clayton Richard. Tim Lincecum. Are you done throwing up yet? OK, good. I’m sorry I had to do that to you, but you had to know the truth. It’s not my fault you couldn’t handle it. The only way for teams to realistically improve their starting rotations right now is via the trade market, and that took a big blow today when the Red Sox managed to swoop in and steal Chris Sale from the bumbling Nationals. Great job, fellas. Let’s examine that trade. Sale is a bonafide ace, and has been among the best pitchers in the American League for the last five seasons. The Red Sox dealt away the top prospect in all of baseball–Yoan Moncada–along with the number 30 overall prospect–Michael Kopech–and two other guys who are now in the White Sox’ top 30, according to the updated MLB Pipeline. Is Tanaka as good as Sale? Probably not, although you could argue that he’s just a different kind of pitcher. That being said, it’s not like Sale is leaps and bounds ahead of Tanaka’s level. They’re fairly close, as far as being able to dominate on their best days and give the team a solid chance to win on their worst days. 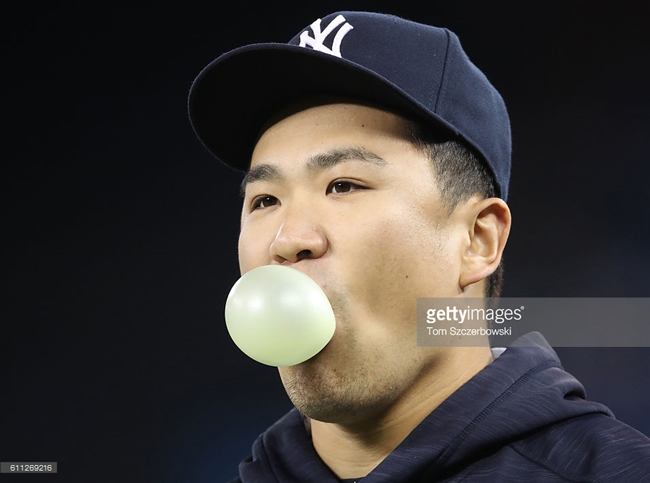 There were times last year when Tanaka, who somehow only finished seventh in the Cy Young award race–you’re telling me there are six pitchers in the American League better than Tanaka?–carried the Yankees very young pitching staff. Many of his statistics equaled or surpassed Sale’s, too. You could take everything I just said and use it as supporting evidence to prove that the Yankees shouldn’t deal Tanaka. For one, their rotation would be left in shambles, with only Michael Pineda and CC Sabathia as its veteran presences, which is extremely scary to think about. The rest of the rotation would have to made up of kids, has-beens or never-weres from the scrap heap. However, is having Tanaka going to win the Yankees a World Series in 2017 if they don’t somehow trade for a lot of help for their right-hander? Even worse, if Tanaka exercises the opt-out clause in his contract after this season–like just about everyone who has ever had an opt-out clause in their contract has–would losing him to another club for nothing in return ever help them win a World Series? What if his troublesome elbow–the one everyone thinks should have already fallen off–finally does go? Will that help them win a World Series any time soon? The answer to all of these questions is a resounding no. Listen. I love Tanaka as much as the next man, but I loved Aroldis Chapman. I loved Carlos Beltran (last year, anyway). I loved Andrew Miller. Guess what though, I was ecstatic when the Yankees traded them away last season because those deals potentially set the team up for success for years to come. Are you telling me that you would say no if the Nationals offered guys like Lucas Giolito (#3 prospect in the game), Victor Robles (#10 prospect in the game) and/or Reynaldo Lopez (#38 prospect in the game)? Giolito and Lopez have already made their big league debuts, and could be ready to join the Yankees rotation right now. If the Yankees keep Tanaka this offseason, they need to make sure they keep him for the next four offseasons too. If they don’t think they can, then they need to strike while the iron is hot, and the pitching market is cold. At the very least, they should see what teams are willing to offer up… right?